A cover crop field day was held Monday, April 9 at Weymiller Bottoms with Ross and Dave Weymiller. Snow prevented us from viewing the cover crops in the field, but the event proceeded indoors. 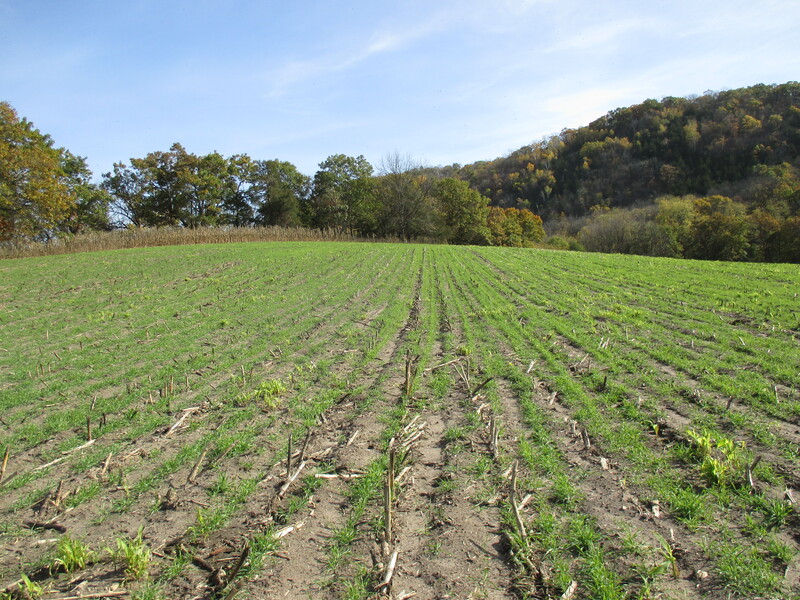 Sara Berges, the Allamakee SWCD Project Coordinator, had worked with Weymillers in the Fall of 2017 to set up several cover crop demonstration sites to compare different seeding/manure application methods as part of a Leopold Center Grant. 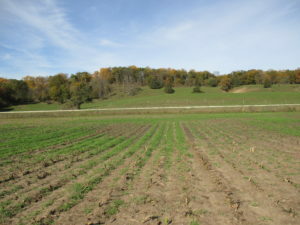 Photos were taken of the sites throughout the fall. 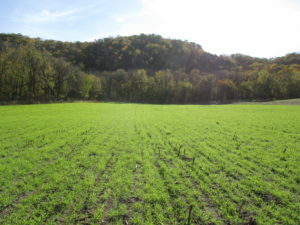 The sites ranged in size from 5 acres to 20 acres and were all seeded with 1 bu/acre of cereal rye. Hog manure was injected either before or after cover crop seeding, depending on the trial site. Corn silage was harvested the first week of September 2017. They were seeded between September 8 and 12 with manure application in the same time frame. Slurry seeding is an uncommon method that we wanted to test to see how it would work for people who do not have a drill or who wanted to minimize the number of passes across a field. The Weymillers’ tank has an agitation auger, which helped mix the seed in. 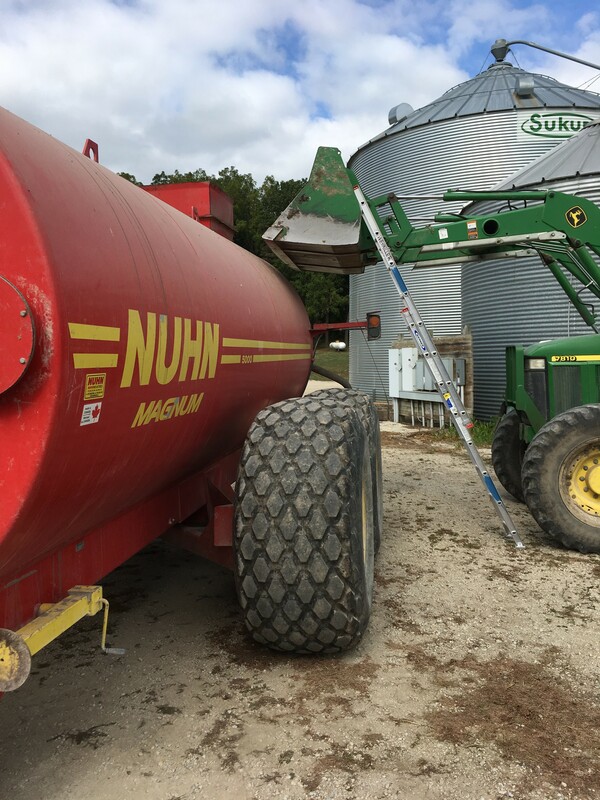 Many people have said that they think hog manure is too “hot” to work with cover crops, but this slurry-seeding trial showed that is not the case. The seed grew, but the seed dispersal was not consistent. It’s thought that the seed floated in the tank and the slope of the ground caused the seeding to be heavy in spots and very light in others. 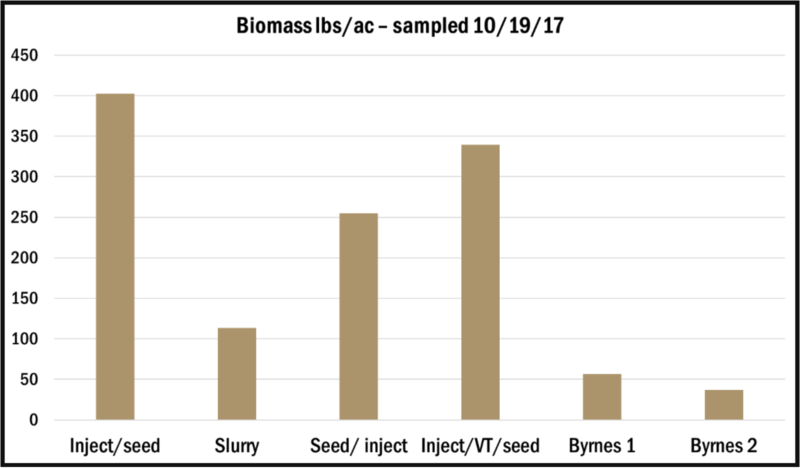 Above-ground biomass samples were taken on October 19, which is right around the standard seeding deadline of October 21 if receiving cost-share. Photos of each site were taken on the same day. We wanted to compare these results to what other producers have tried in the area. Matt Byrnes broadcast 66 lbs/ac of cereal rye on September 25 on silage acres with his pelletized lime. He surface applied 10,000 gallons of dairy manure 2 days later. Biomass samples were also taken on October 19 at the Byrnes site. 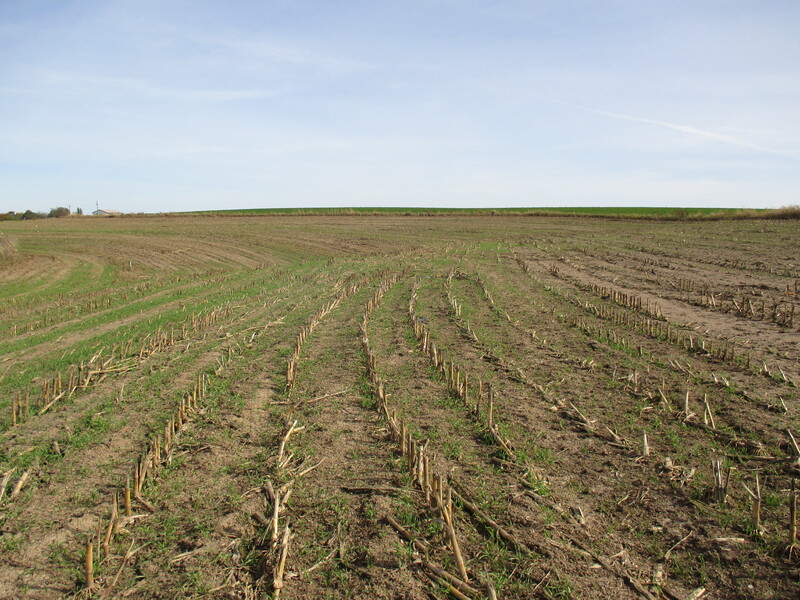 The site with the highest dry biomass was site 1 (402.8 lbs/ac) which had manure injected before the cover crop was seeded. The site that was vertical tilled after manure injection had biomass of 339.2 lbs/ac. The site with the manure injected after the cover crop was drilled had biomass of 254.9 lbs/ac, likely due to some of the seed being buried by the discs on the manure injector. The slurry seeded site had dry biomass of 113.1 lbs/ac, which was the lowest biomass of the Weymiller sites. Although the slurry-seeding had mixed results, it still had higher biomass on October 19 than broadcasting the seed. Keep in mind that the slurry-seeding was done 2 weeks before Byrnes broadcast his cover crop. Other sites that were seeded on or after October 21 had very little (to no) fall growth. This shows the importance of early seeding. 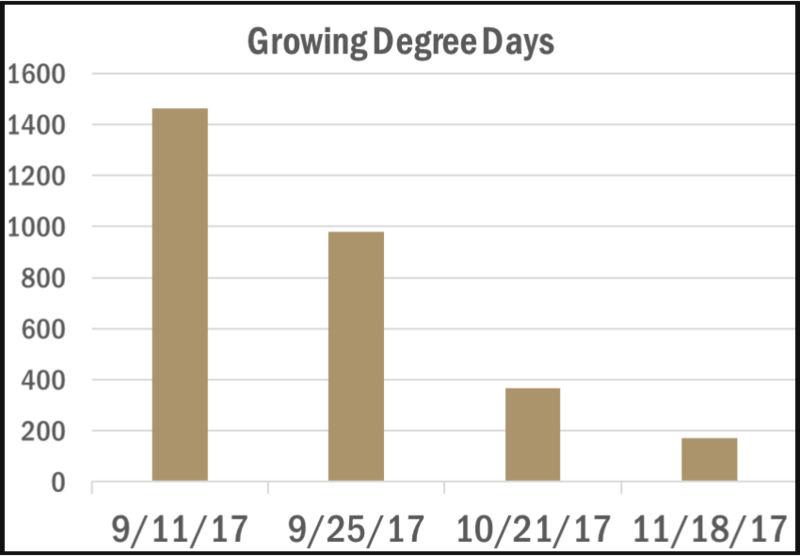 The growing degree days were calculated for cover crops for several different dates to show the potential for fall growth last fall. 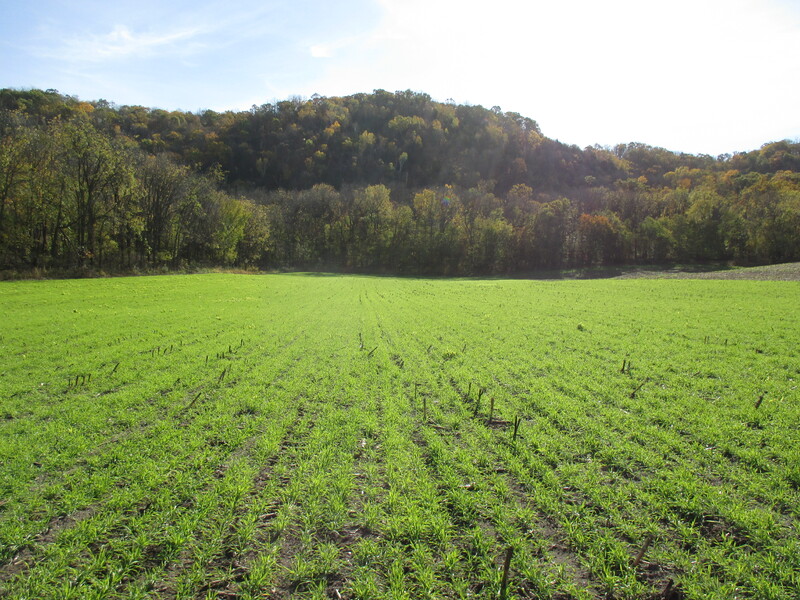 We encourage producers to get cover crops seeded as early as possible. If you are waiting for soils to cool before applying manure, you can still go ahead and seed cover crops. Several local producers have injected manure into growing cover crops or surface applied manure to growing cover crops and been very successful. If you harvest corn silage, we strongly recommend that you plant cover crops. Silage ground is left bare much earlier in the growing season. This early harvest creates the opportunity to plant more diverse cover crops if you’d like to try something other than just cereal rye. You could plant brassicas like radishes or turnips to help break up compaction or red clover or Austrian Winter peas to provide nitrogen. However, winter-kill species need to be planted by September 9 if receiving cost-share. Weymillers hosted a field day on April 9. Project Coordinator, Sara Berges, presented on the results of the demonstration sites. The NRCS Area Agronomist, Neil Sass, talked about the benefits of including cover crops on acres that have manure application as well as results of a study showing how seeding date, seeding rate, and termination date can affect the amount of cover crop growth. 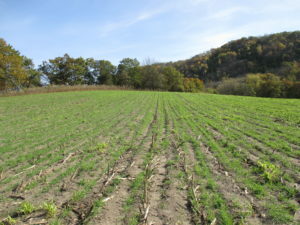 His data showed that if you are able to get a cover crop seeded by early October (and are NOT receiving cost-share), you can likely back down the seeding rate. However, if you get it seeded late, you may want to let it grow longer in the spring to get the most out of it. Thank you to the Weymillers and other producers who were willing to talk about their cover crop experiences. There was a lot of good discussion at the field day and many interesting questions. Q1. If you apply manure to cereal rye, but then plan to harvest it for grain (seed), is it likely that there will be lodging issues? It depends on the amount of manure applied, the timing of manure application, the existing soil nitrogen level, and the variety of rye planted. Excess N will increase the potential for lodging, but some varieties are more susceptible than others and we would suggest reading the variety trials from the University of Minnesota or other sources. Rye is less prone to lodging than oats. Q2. Can you follow rye with alfalfa? Are there issues with rye reseeding? Alfalfa can be seeded in August following rye harvest. There will likely be volunteer rye, so you will probably need to spray with glyphosate. Light tillage may also be necessary to ensure a proper seedbed, although no-till seeding can work. Rye straw will likely need to be baled if no-till seeding. 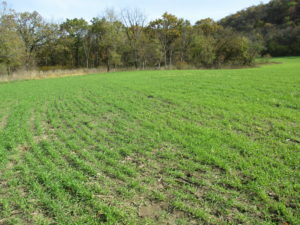 If you don’t plan to plant something following rye harvest, some producers who harvest rye gain/seed allow the rye to reseed to serve as their cover crop for the fall. Q3. Do you need to change your herbicide program for fields that will have cover crop? Read the labels on your herbicides to determine the crop rotation restrictions. If you plan to use the cover crop as forage/feed, the restrictions will be even more limiting than just looking at the potential for carryover injury. 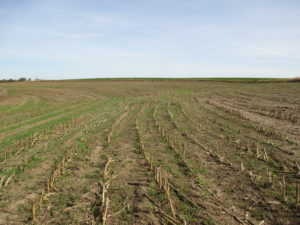 Two factors affect the potential for carryover injury; the length of herbicide persistence and the sensitivity of the cover crop to the potential herbicide residue. Q4. 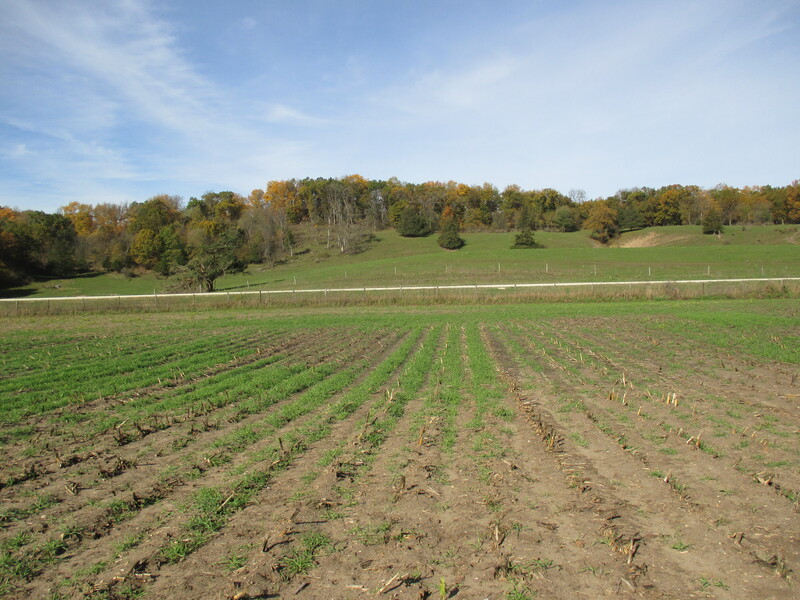 If broadcasting cover crop after corn harvest, how do you ensure good seed-to-soil contact? If there is a lot of residue, the seed will not make good seed-to-soil contact and some amount of incorporation would likely be needed. Another alternative on corn ground would be to interseed ryegrass, turnips, buckwheat or other winter-kill species at V4-V6. Q5. What are other ideas for getting cover crops seeded on manure ground? Some ideas are setting up an air seeder on a vertical till machine or somehow seeding with a dragline. If anyone has something they’d like to try, contact Sara Berges at the SWCD and we’ll do what we can to help you set up a trial. Financial assistance may be available to help defray the cost of planting cover crops with manure.